One on friends had recorded some videos using Panasonic HDC-TM900 as part of her research. She would like to insert the camcorder videos to Keynote on Mac for presentation. However, the resulting HD videos are in AVCHD .mts files which could not be imported to Keynote. With the 1080/60p recording mode, the videos play great on the TM900 camcorder, however, Mac is not compatible with this format, not even iMovie, Final Cut or others. While looking for a solution to add recorded AVCHD videos to Keynote, UFUSoft AVCHD Converter for Mac is recommended as the partner to Panasonic TM900 for Keynote presentation. It helps easily creating a vivid slideshow presentation with HD videos by converting AVCHD video to HD MOV. Below is the quick guide for you to embed AVCHD videos to a presentation created with Keynote. Here I am taking Panasonic HDC-TM900 camcorder 1080/60p MTS as an example. Connect Panasonic TM900 camcorder to Mac computer, and the camcorder will be shown as CAM_MEM. 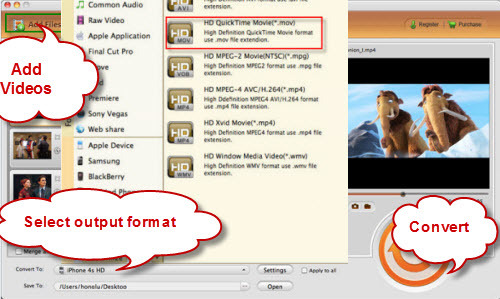 Find the .mts files from AVCHD > BDMV > STREAM, and transfer the AVCHD videos to Apple computer hard drive. Run AVCHD Converter for Mac as the best Mac Panasonic TM900 AVCHD to Keynote converter, and click the “Add” button to load the .mts files. Step 3. Convert Panasonic TM900 MTS to MOV for Keynote on Mac. Click the convert button under the preview window, and the Mac MTS/M2TS to Keynote converter will start converting Panasonic TM900 AVHD .mts videos to HD .mov for Keynote presentation.